This April, Stress Awareness Month, our Featured Teas lineup highlights four herbal teas to help you destress. Read below to learn more about what we're sipping on this month, and be sure you're logged in to your MY SIPS profile to link over to our product pages to learn more. Don't have a MY SIPS profile? Create a free profile here to access special offers if you'd like to enjoy one of these featured teas yourself! This soothing blend consists of antioxidant-rich South African rooibos and herbs that help relieve mental and physical stress. Perfect for helping you relax and unwind after a long day. Based out of Southern Oregon, Full Leaf Tea Company was created by husband and wife team Matt and Lisa, and offers a wide variety of loose leaf teas, matcha and accessories. Their teas are created by in-house tea artisans and blenders, giving their customers an array of products that can't be found anywhere else! We love the attention and detail that the Full Leaf Tea Co team puts into each and every order - their teas are hand-blended and packaged, and their brand truly revolves around their customers. We also love the variety of tea you can find, including unique wellness teas designed for certain health functions! Click here to learn more about Organic Relieve Stress and to access a special offer from Full Leaf Tea Co! Drink in the essence of tranquility. This caffeine-free blend features sustainably harvested pure herbs that help reduce stress and create a luxurious relaxing experience. Born in the UK, Buddha Teas founder John Boyd grew up immersed in the culture of tea. After moving to the US in 2006, he realized that his unadulterated tea choices were limited. With a desire to create an expanded selection for tea lovers seeking purity like himself, John became inspired to develop a tea company to fill the gap. He approached his longtime business partner, entrepreneur Nicholas Marier, they gathered an exceptional team, and Buddha Teas was born. Buddha Teas is all about clean and truth - their teas are crafted without any artificial or even natural flavorings. The name Buddha Teas came into being out of the intention to reflect a philosophy that espouses living life in harmony with the world. Simplicity, generosity, and compassion, a company devoted to offering teas that support consumer and planetary health and healing. 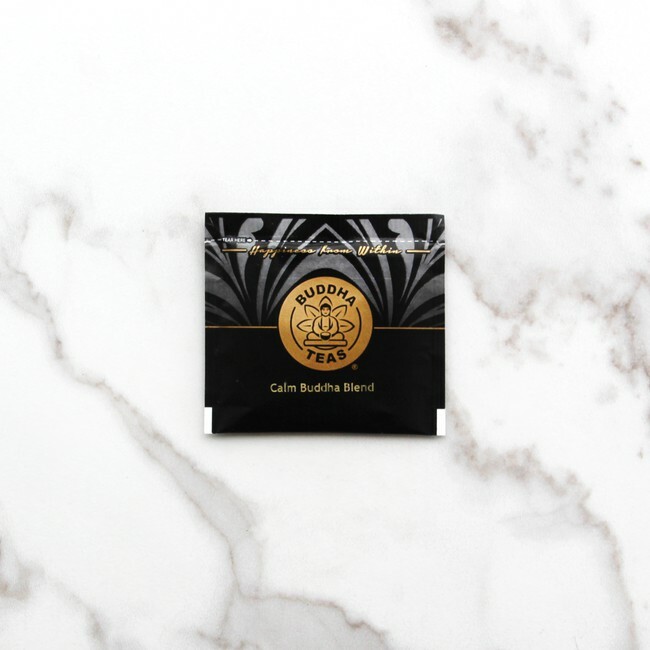 Click here to learn more about Calm Buddha Blend and to access a special offer from Buddha Teas! This herbal infusion is designed to help relax your body and mind. After a busy day, for quiet moments, or before you go to bed - this blend will help calm your mind and ease your body. 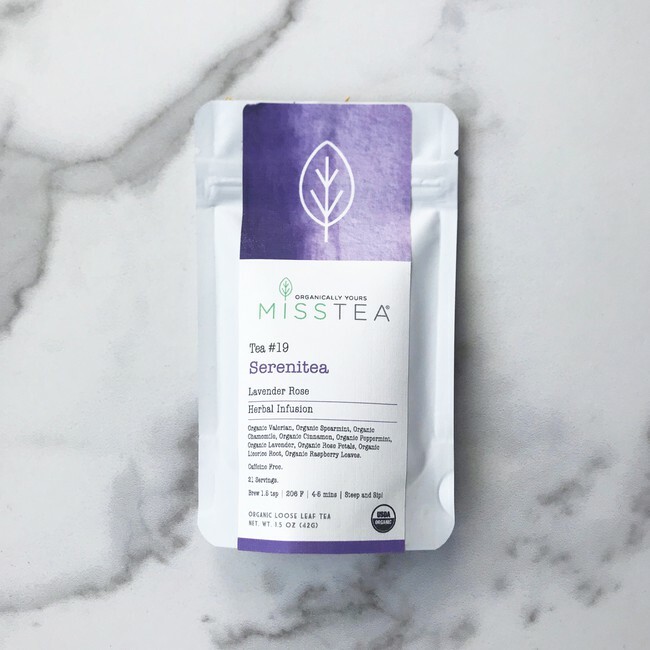 Founded in 2008 and based in Brooklyn, NYC, Miss Tea is passionate about helping people find moments of balance within their busy lives through tea. They were born and raised surrounded by nature, gardened their own herbs, and throughout their world travels, they always found their way back home with a cup of tea. Miss Tea goes back to their roots and shares with NYC and beyond a relaxation experience in the form of unique herbal infusions from all around the world, that comfort the body and relax the mind. Miss Tea is committed to creating a strong community of tea enthusiasts who also care about impacting their environment and its people in a positive way. They donate a percentage of revenue from every purchase straight back to charity! Check out their website for a lovely assortment of not only tea blends, but also beautiful teaware, incense, honey, soaps and more to create a complete relaxing tea experience! Click here to learn more about Serenitea and access a special offer from Miss Tea! 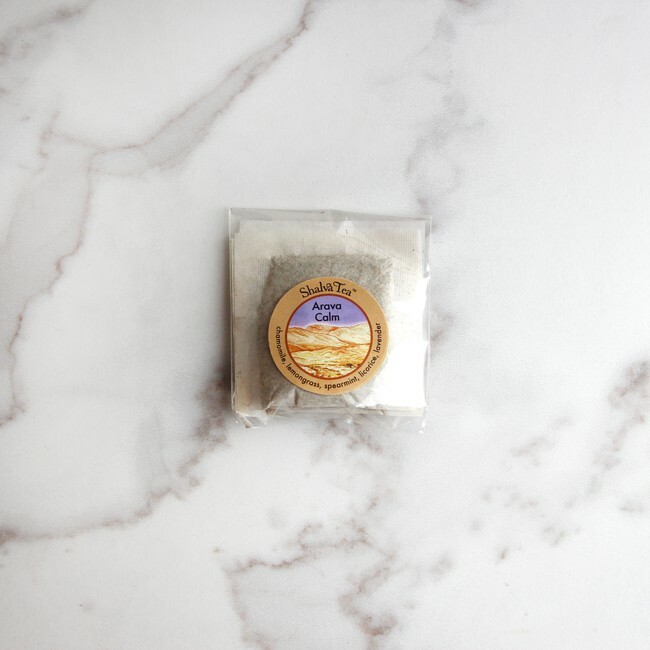 Part of the ancient Incense Route connecting the Middle East with Africa, the Arava Valley is home to a delicate array of aromatic and hearty herbs nestled far below sea level. This blend is a delicious mix of fragrant herbs, perfect before bed or for an upset stomach, or whenever you need a cup of relaxation. ShalvaTea was founded in 2014 by David Ross. While earning his Master in Forestry from Yale University, he took a U-turn and decided to travel to Israel after the devastating Mt. Carmel wildfires of 2010. While spending a summer researching the causes of, and potential solutions to, these kinds of fires, he stumbled across an abundance of native aromatic herbs, bringing them home to drink as relaxing teas after days in the field. After completing his masters, he returned to Israel on a Fulbright Fellowship to finish his research, continuing with his herbal concoctions until he realized that this was his real passion! Each ShalvaTea blend carries the name of a different ecological region in Israel, with freshly dried herbs inspired by the array of plants that are found growing wild across these ancient landscapes. These herbs have been combined in unique blends, with the aim of capturing the calming shalva (meaning "peace" or "calm" in Hebrew) essence of each landscape and bringing it straight into your cup of tea! Click here to learn more about Arava Calm and access a special offer from Shalvatea! We hope you enjoy our featured teas this month. For some delicious tea-infused recipes that to inspire your Spring, go check out your MY SIPS page! Did you know that Staci and Mel taste each month's Featured Teas live on Facebook? A great reason to join our community of tea lovers there! Join us on Saturday April 13th at 2PM for this month's Live Tasting!